What can you do with Smart Objects? Transform bitmap images without losing quality. Whenever you scale, rotate, skew, or warp a Smart Object, Photoshop works with a fresh copy of the original content stored in the Smart Object. This means that you don’t progressively degrade the content as you apply additional transformations. Make global changes easily. You can create many duplicates of a Smart Object — for example, you might duplicate a logo Smart Object several times in a document. Then, when you change the contents of 1 Smart Object, all the others update automatically. Here’s a neat trick: Since Smart Objects are effectively embedded Photoshop documents, you can create additional Smart Objects inside a Smart Object, thereby nesting Smart Objects. This can be useful if, for example, you’re creating a complex logo that you might want to tweak globally later. 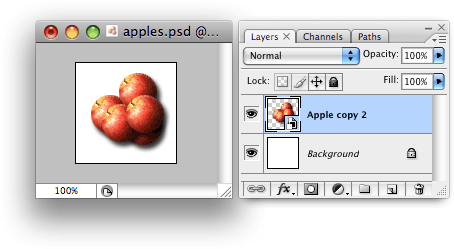 Photoshop lets you import artwork from Illustrator and embed it in a Smart Object. This means you can manipulate the artwork in Photoshop, and still have the freedom to edit the original artwork in Illustrator if you wish. Set up Illustrator to copy and paste the artwork correctly. In Illustrator, choose Preferences > File Handling & Clipboard, then make sure the PDF and AICB (no transparency support) options are selected. Copy and paste the artwork. Open the Illustrator and Photoshop files. 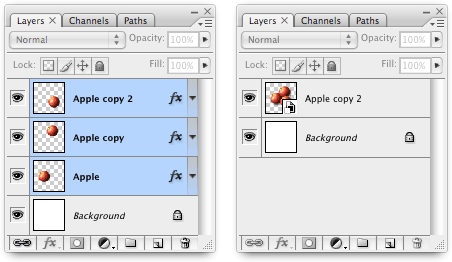 Select the artwork in Illustrator, then copy it (Edit > Copy). Now paste it into your Photoshop document (Edit > Paste). In the Paste dialog that appears, choose the Smart Object option. Position the artwork in the Photoshop document. You’ll see your artwork appear in Photoshop, overlaid with a blue cross. Drag the artwork to position it, or use the transform handles to scale, rotate, skew, or warp the artwork (much like using Edit > Free Transform). When you’re done, press Enter/Return to create the Smart Object. 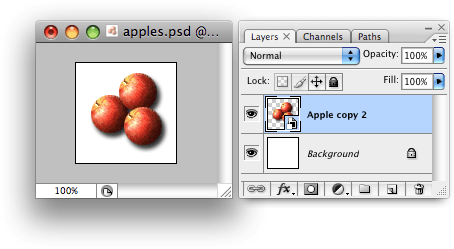 You can also drag Illustrator layers or objects into Photoshop to create Smart Objects. Finally, you can create a Smart Object by importing an image file. Photoshop lets you import practically any type of image format, including PSD, JPEG, PNG, GIF, TIFF, PDF, EPS, and more. Choose File > Open As Smart Object. This creates a new Photoshop document containing the opened image file as a Smart Object. Choose File > Place. This imports an image file as a new Smart Object in the currently-open Photoshop document. When you import an image this way, you’ll get a chance to reposition and transform the object, as described in “Creating from Illustrator artwork” above. When you import an image file as a Smart Object, a copy of the image file is embedded in the Smart Object. The original image file is untouched. When you transform a Smart Object, you’re working on a fresh copy of the original Smart Object data. This means you can transform a Smart Object as many times as you like without degrading the image further each time. Very handy! Finally, save and close the new document window. The Smart Object in the original document updates to reflect your changes. When you edit a Smart Object, Photoshop saves the Smart Object’s contents as a temporary file and opens the file for editing. You then make your edits to this file. When you save the file and close it, Photoshop copies the contents of the file back into the Smart Object, then deletes the temporary file. You delete a Smart Object in the same way as a regular layer — for example, you can drag it to the Layers panel’s trash icon, or right-click it and choose Delete Layer. As you’d expect, deleting a Smart Object also deletes its contents. Drag the Smart Object in the Layers panel down to the New Layer icon at the bottom of the panel. Select the Smart Object, then choose Layer > Duplicate Layer (or choose Duplicate Layer from the Layers panel menu). Right-click the Smart Object and choose Duplicate Layer. Here I’ve duplicated the “Apples” Smart Object. The duplicate is called “Apples copy”. 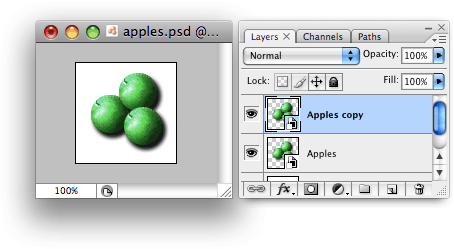 Next I’ve edited the “Apples copy” Smart Object and added a Hue/Saturation layer to turn the apples green. When I save the edits to the Smart Object’s contents, the other Smart Object also updates to reflect the change. Only the contents of the Smart Objects are linked. You can still change other properties of each Smart Object — such as opacity, blend mode, and layer effects — independently. What if you don’t want the duplicate Smart Objects to be linked? To create an independent duplicate, select the Smart Object and choose Layer > Smart Objects > New Smart Object via Copy. Alternatively, right-click the Smart Object in the Layers panel and choose New Smart Object via Copy. Also, if you copy a Smart Object by dragging it into another document, the 2 Smart Objects remain independent. Useful though Smart Objects are, they can take up a lot of RAM and hard drive space — particularly if they contain many high-res layers. Furthermore, there are some operations — such as the Distort and Perspective transforms — that you can’t use with Smart Objects. Select the Smart Object, then choose Layer > Smart Objects > Rasterize. Select the Smart Object, then choose Layer > Rasterize > Smart Object. Right-click the Smart Object in the Layers panel and choose Rasterize Layer. This turns any vector layers and layer effects in the Smart Object into bitmap layers, then flattens all the Smart Object’s layers into a single bitmap layer, discarding the original contents of the Smart Object. If you’ve applied any Smart Filters to your Smart Object, these filters are permanently applied to the Smart Object when you convert it to a regular layer. I hope you enjoyed reading this tutorial. Happy Photoshopping!